Sometimes, it’s good to step back and just take a deep breath. You ever have those moments where you look back at the last month and just wonder, “How the heck did I survive that?” NSO (New Student Outreach) is always eventful. And being honest, we (the staff and student leaders) are all very tired and definitely depending on the Lord’s strength. But as we’ve stopped and taken that deep breath, we can’t deny all the ways we’ve seen God at work. It has been awesome to see our leaders take risks and really take hold of the vision for our campus. It is exciting to meet all the wide-eyed freshman and encounter upperclassmen checking us out for the first time. We’ve also encountered more non-Christians open to exploring who Jesus. 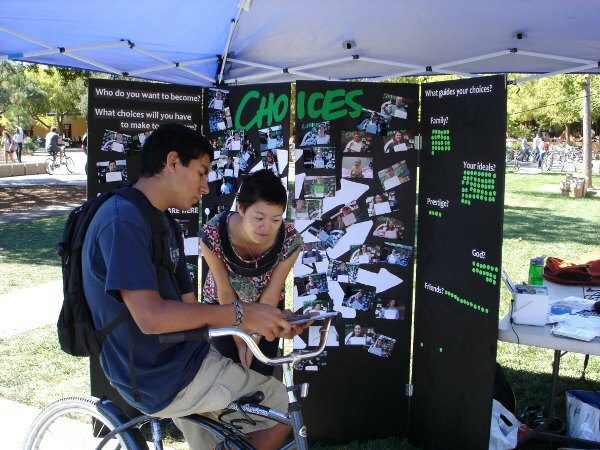 One of the highlights was our "Choices" proxe station, which was basically an interactive display to help us connect with people on campus. We wanted to go beyond normal forms of tabling and really engage with a wide range of folks on campus. We asked anyone and everyone (willing to stop), to tell us about the types of choices they are making and what influences those choices. In these conversations we asked people about how (if at all) God fits into those choices. 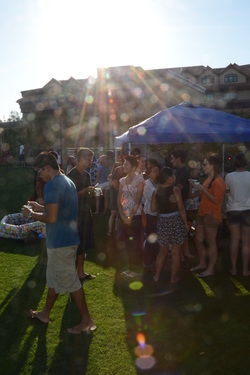 It was a fun way to engage the campus with spiritual conversations. We had a ton of great conversations and interacted with hundreds of students. The crazy part was that over half of the students we met were non-Christians. That is way more than we would have interacted with if we were still sitting behind a table with our “Intervarsity” poster. A number of these non-Christians have come to other events and we’ve even started a couple of GIGs (Groups Investigating God). As we’ve stepped out in faith and risk, we’ve seen God show up. One Last Day of Summer a Success! We had a great time at One Last Day of Summer! The shaved ice was a big hit. Met a whole bunch of students from all over campus. Many students were interacting with the proxe station discussing choices. And lots of sports and hanging out. Our old website is needing to retire. We hope you like the new one! Special thanks to USC's IV Trojan CF for their design ideas!